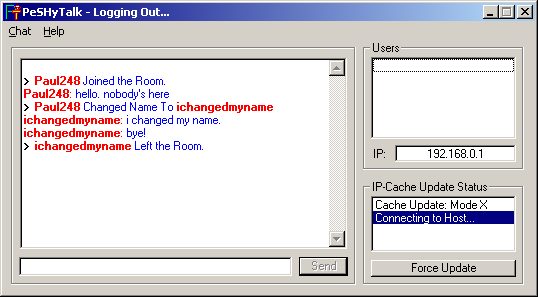 PeSHyTalk (Peer-Server Hybrid) is a combination of the concepts used in cgiChat and PeerChat. The program connects to a website to find the IP addresses of other PeSHyTalk users, then all further communication is sent directly over the network to other users. This was designed primarily to work at my school, so there may be problems if you use it elsewhere.